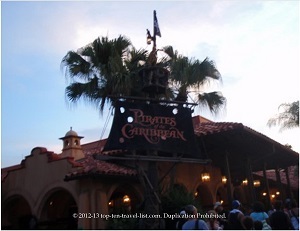 Vacation Spotlight: Orlando, Florida - Top Ten Travel Blog | Our experiences traveling throughout the US. With over 51 million visitors per year, Orlando claims a spot as one of the top tourist destinations in the country. 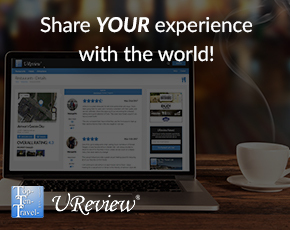 Warm weather, theme parks, water parks, and fun filled resort hotels draw people from all over the world each year. Home to Walt Disney World, the best theme park in the world, Orlando is the perfect family vacation destination. The fun doesn’t stop at Disney! There are plenty of other fun amusement parks and attractions such as Sea World, Universal Studios, and 2 of the top water parks in the world. Add in fun themed restaurants, wonderful shows, shopping, recreation, and you find yourself surrounded with endless exciting opportunities. Whether you are 7 or 77, you are bound to have a fabulous time. 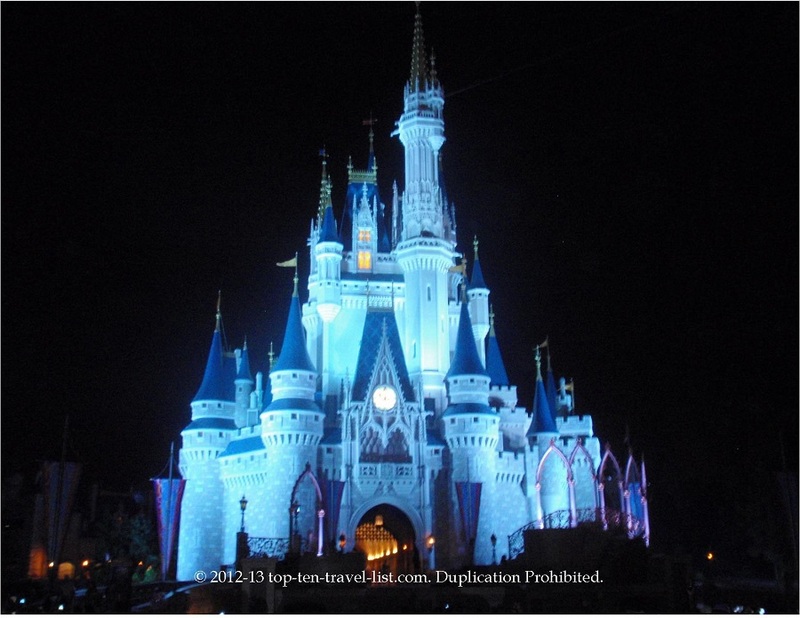 You are never too old to visit Disney – I didn’t myself until my upper 20’s! Below, I have highlighted the best theme parks in the Orlando area. 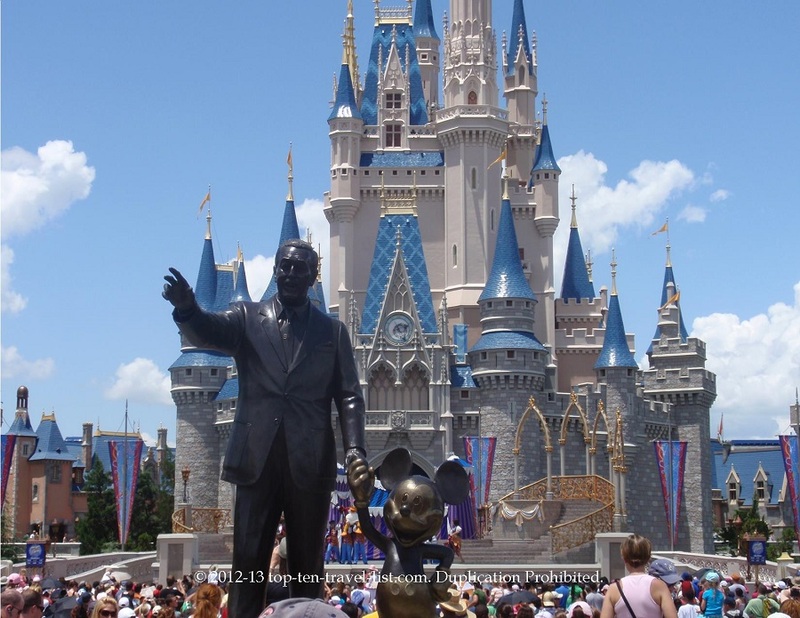 Walt Disney World includes 4 parks: Magic Kingdom, Epcot, Animal Kingdom, and Hollywood Studios. Many people are unaware that Universal Studios is a separate park. 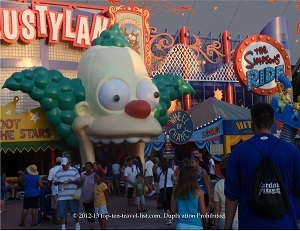 Although Universal Studios/Islands of Adventure are located in the same area, they are actually owned by NBC Universal. 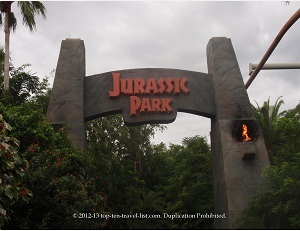 Regardless, both parks are a must on any visit to Orlando. While different, both parks offer a once in a lifetime experience that can’t be duplicated anywhere else in the world. Hollywood Studios – My favorite Disney park is Hollywood Studios, which has a fantastic selection of thrill rides and exciting live shows. 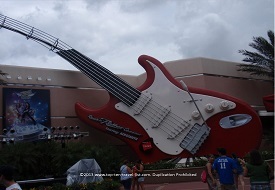 Tower of Terror and Aerosmith’s Rock N’Roller coaster are 2 of the best rides in all of the Disney parks. 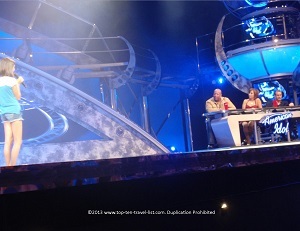 In addition, great shows such as The Extreme Car Stunt Show and American Idol Live experience provide entertainment for the whole family. I recommend at least 2 days here to experience everything in the park. One day was just not enough time! 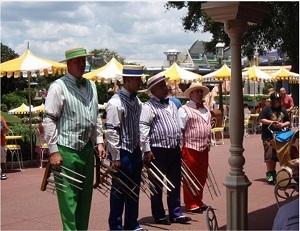 Magic Kingdom – You can’t visit Disney without at least 2 visits to the Magic Kingdom. All of your favorite Disney classics are transformed into fun rides for the whole family. Highlights include: Pirates of the Caribbean, The Haunted Mansion, and Monster Inc. Laugh floor. 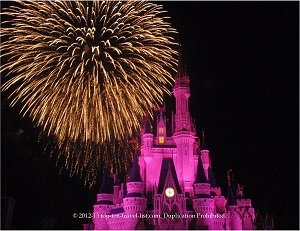 However, the real magic arrives nightly at the fabulous firework show and parade featuring all your beloved Disney characters. Epcot – Epcot is like taking a trip around the world, minus the expensive airline tickets. The famous World Showcase features 11 pavilions, each representing a different country. In terms of rides, Soarin’ and Spaceship Earth are both very interesting. What separates Epcot from the other theme parks is the combination of education and fun found in every ride and attraction. 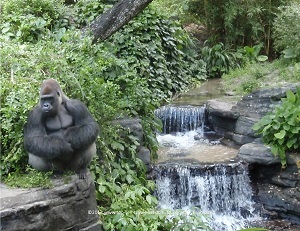 Animal Kingdom – The highlight of this Disney park is an entertaining safari ride. 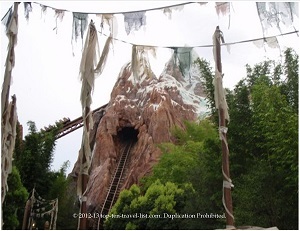 Expedition Everest, a unique roller coaster features fantastic animatronics, a great twist, and great views of the park. Kail River Rapids is another must – the perfect thrilling family raft ride to enjoy on those hot, humid summer days. 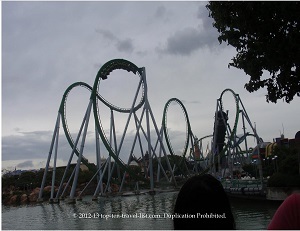 Universal Studios/Islands of Adventure – Universal Studios is almost as fun as Disney. 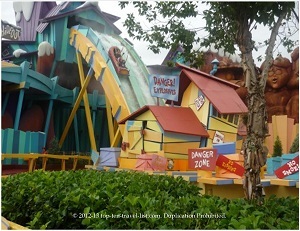 The variety of movie themed, interactive, thrill, and water rides lead to hours and hours of fun. Although you could attempt to squeeze in all your fun in a day, I would recommend purchasing the 2 day pass. Islands of Adventure has so many fantastic rides, however, you will be limited on time as the lines are long (make sure to purchase a fast pass). 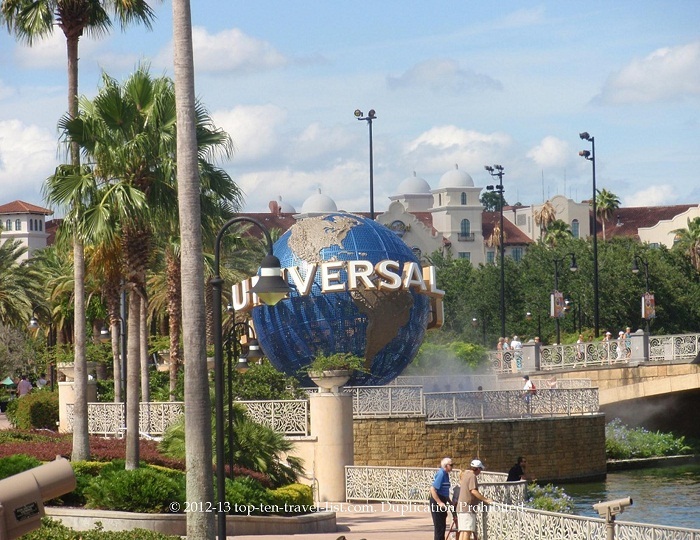 Do yourself a favor and plan for one day at Universal Studios and one at Islands of Adventure. 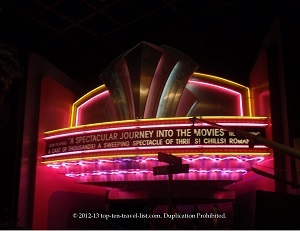 For more information on top Disney and Universal rides, please visit my Orlando Top 10 lists: Universal Studios Top 10 list, Walt Disney World Rides Top 10 list, Walt Disney World Entertainment Top 10 list. Skip all the pricey resorts and come home to a quiet condo rental. If you are like us, you will be spending all day at the parks and will not have much use for the extras at the Disney resorts. 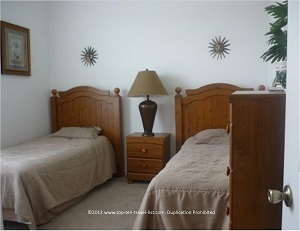 Windsor Resorts offers affordable rentals with plenty of useful amenities. 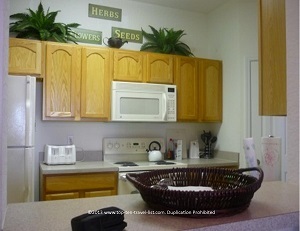 The 3 bedroom condo rentals include a full size kitchen, washer and dryer, king sized beds in the master bathroom, free Wi-Fi, and free Netflix movies. In addition, you will have access to plenty of outdoor recreation, including: a pool with water slide, a hot tub, tennis and basketball courts, and a sand volleyball court. 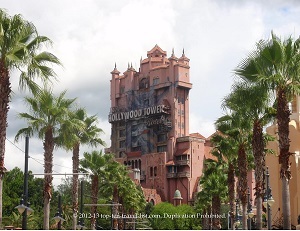 You will only be a 5 minute drive from the Disney parks and 15-20 minutes from Universal and Sea World. 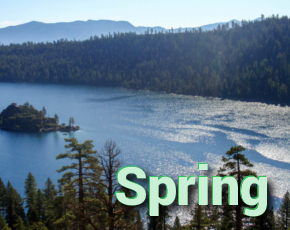 Rates start at just $100-135, based on time of year and holiday season. No matter what month you decide to visit, you will be getting a fantastic deal over other Orlando hotels and resorts! I really enjoyed my stay at Windsor Hills. I will definitely book with them again for any future Orlando vacation. 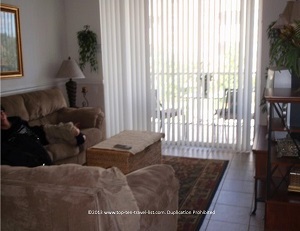 For more information, visit the Windsor Hills Condo Rentals website. Hard Rock Cafe is my favorite US themed restaurant. I love the music, memorabilia, and touristy atmosphere. 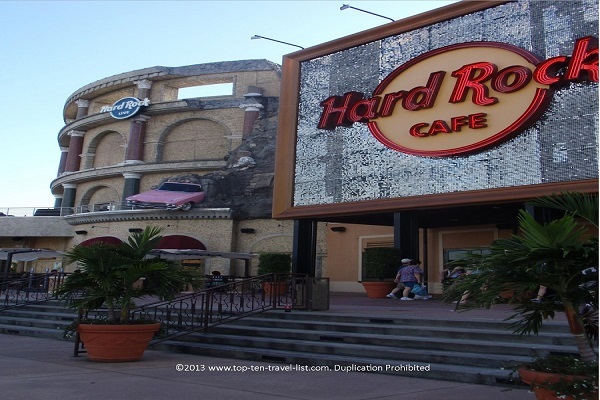 Hard Rock Orlando is situated amidst numerous bars, clubs, restaurants, and shops in Universal’s entertainment hub, CityWalk. This location in Universal’s CityWalk area is one of the biggest and most exciting. It is a great choice for families due to the eclectic menu, featuring everything from salads to burgers to pasta. Dining at Hard Rock keeps the fun going long after your day out at Universal Studios! View the Hard Rock Orlando Menu. 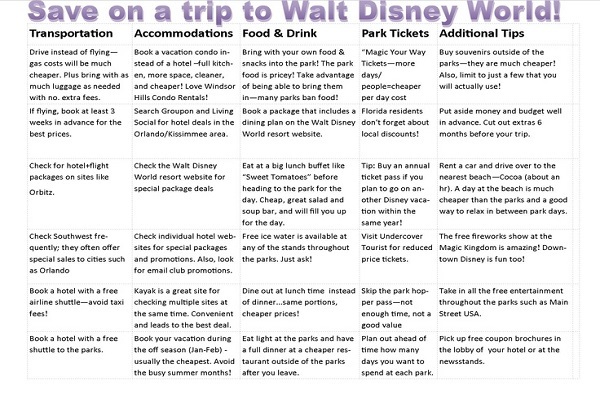 Take a look at my handy chart below filled with some helpful tips on how you can save on your next Disney trip. 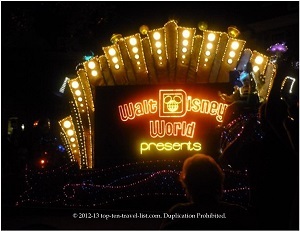 Also be sure to check out my Saving Money on Your Walt Disney World Vacation post for additional information. Visit the Walt Disney World website for ticketing information and hours of operation for each park. 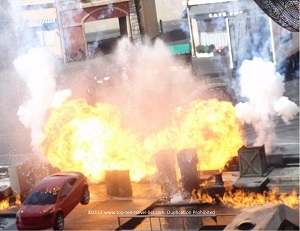 Visit the Universal Studios website for ticketing information and hours of operation.